What’s the Best Mustache Wax? If you finally decided to grow that handlebar mustache you always wanted, besides patience, at some point you’re going to need the right wax. It’s probably the single most important product that you’re going to ever need for this facial hair style. Without the right mustache wax, you will not be able to achieve the exact look. But, how can you pick the best mustache wax? And how do you use it properly once found? Let’s try to answer these questions. Before taking a look at our top picks, the first thing we need to do is learning how to choose a mustache wax that best fits your needs. There are multiple varieties out there, but generally they fit into one of these categories: petrochemical free, soy free, tinted, organic and vegan. Most of them have different strengths too: light, medium, strong and extra-strong. 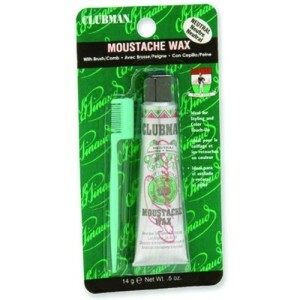 Lighter waxes are generally best fit for shorter mustaches. They render a nice shine and are mainly used to control stray hairs. Medium, strong and extra-strong waxes are better choices for longer mustaches. 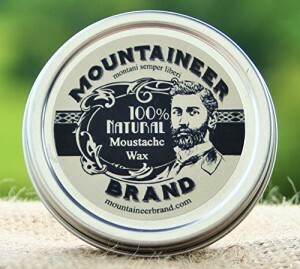 As a guideline, the stronger the wax the better it holds the mustache and the better it holds in hot and humid weather. So, now that you learned about the different types of waxes available, it’s time to learn how to apply the one that best fits your specific requirements. First off, you need to warm up the wax just a bit, so that it’s easier to use. Probably running it under warm tap water will do the trick best, because you don’t want to turn into liquid. You could also use a blow-dryer but it’s not recommended because you can easily overdo it. After getting the wax into the perfect state, you just have to get a tad bit on your finger, not too much, if you don’t have a monster ‘stache, and roll it into a ball, before flattening it between your fingers. If you successfully passed all these steps, you’re at the point where you can work the wax into your mustache. When applying wax to your mustache, remember to always starts from the center and go towards the ends. Try to get an even spread, and add some more of it towards the ends, in case you want that classic handlebar style. If you feel like you don’t achieve a good enough spread, you can use a small comb or even a child toothbrush to get the job done. So, which are our top picks? This mustache wax is definitely one of the best choices out there. 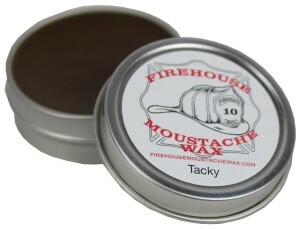 When looking for a mustache wax, chances are you would like to tame that ‘stache and give it a certain form. 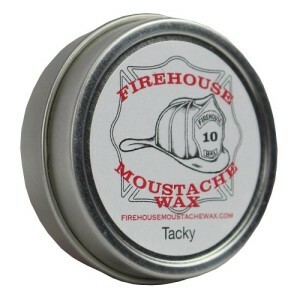 Firehouse Moustache Wax is stiff enough to help you style even longer mustaches. It’s created by fireman John Pitts, hence the name. But the name is also a smart match because the wax will hold even in hot and humid weather. It’s high quality and strong hold make it a great option if you want to style a handlebar, for example, but it’s also great for those less experienced because it’s easy to apply. The important advantage of this mustache wax is definitely the quality of ingredients. 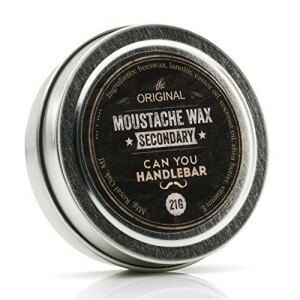 CanYouHandleBar Secondary Moustache Wax is made, inspected and packaged by hand. They used local wax (from Michigan bees), USP lanolin, castor oil, coconut oil, shea butter and vitamin E to make this product. Probably the biggest advantage is, that besides the natural content, it offers a strong hold throughout your day. If you’re looking for a natural wax that offers a strong hold, CanYouHandleBar Secondary Moustache Wax might turn out to be a great choice for you. 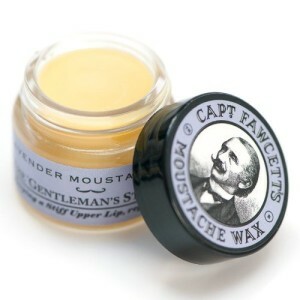 Captain Fawcetts Moustache Wax is handmade in England, only of the finest natural ingredients. It’s definitely one of the stiffest waxes that you can find. I wouldn’t call it extreme, but it definitely will keep up in extreme conditions. It’s actually pretty solid in the jar as well. You will have to use the back of your nail the get small amounts out and warm it up before applying it to your mustache. It comes in 3 aromas: Lavender, Ylang Ylang and Sandalwood. Although at first it seems as a pretty small amount, as you will later see, it will last for a few weeks. This might be a great option for you if you search for a mustache wax that has a natural formula and offers superior hold. 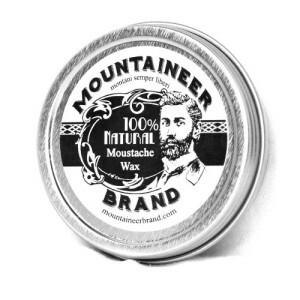 Mountaineer Brand Moustache Wax is handmade in West Virginia. Right off, it’s a 2 ounce can, which is almost double the quantity of most other waxes. It’s made of all natural ingredients like beeswax, natural oils and essential oils. It’s completely free of any chemicals or petroleum. As much as hold is concerned, it offers great hold but is not as stiff as others that we included in our list. You would want to go for this wax if you want something completely natural that will last for a longer time and is tint free offering a natural look. We think it’s a great wax for any mustache, and so might you. Clubman Pinaud Moustache Wax is also a great option if you want something made of mainly natural ingredients that is easy to use. A really cool thing about this package is that it also contains a comb, that will turn out to be really helpful, especially if this is the first time you’re styling a mustache. Another advantage is the ease of use and all day hold. Although it will hold up well the entire day, at the end you’ll be able to wash it out without too much hassle. If you’re looking to cover any gray hairs, this wax will get the job done. You can choose from 3 colored and one neutral. It’s most likely going to cover your needs. So now that you’ve seen our top picks, it’s ultimately up to you to decide which is the best mustache wax for you.